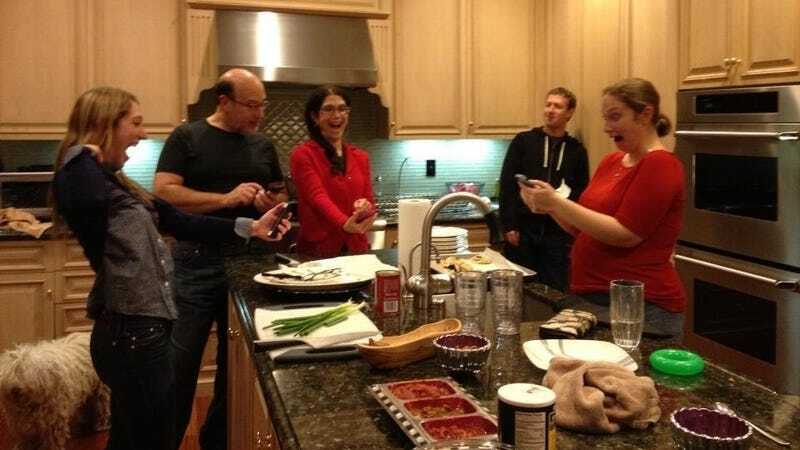 Randi Zuckerberg shared the above photo of her family—including Facebook Czar-in-Chief Mark Zuckerberg—on Facebook. Then it got out into the world, and Randi got all upset about her privacy. Oh, boo hoo, Randi! The story goes like this: Randi Zukcerberg posted the photo of her family fooling around with Facebook's new Snapchat clone, Poke. When the photo popped up on her newsfeed, Vox Media's Callie Schweitzer thought it was a public Facebook post. Schweitzer subscribes to Zuckerberg's feed and she and Zuckerberg aren't Facebook friends. So Schweitzer posted the adorable picture to Twitter without thinking too hard about it. Then Randi cried foul that her privacy had been violated. Turns out Schweitzer is friends with yet another Zuckerberg who appears in that photo, and that's why it popped up in her feed. Schweitzer immediately apologized and deleted the original tweet.